Nothing like a lime green old race car, eh? 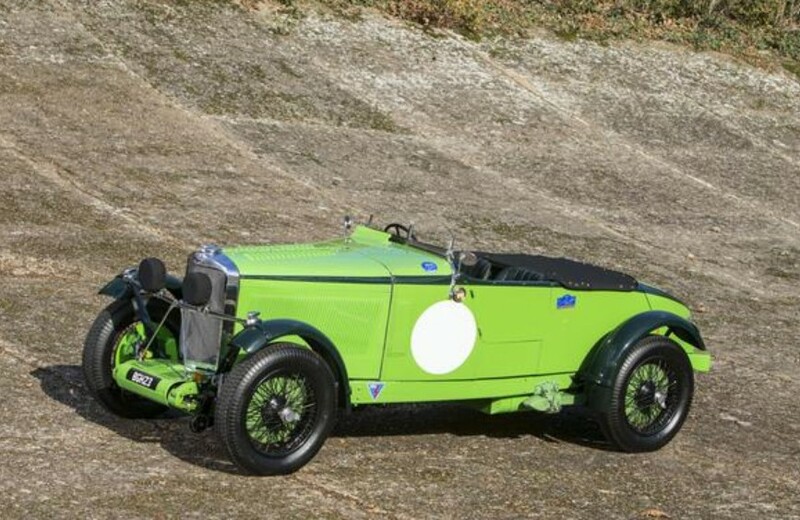 This sporty Talbot is from the British Talbot and was a works race car. This is one of three Alpine Trial Talbots built for 1934. But this car had a bigger engine than the other two. It’s a 3.3-liter straight-six making 126 horsepower. The 1934 Alpine Trial was the sixth such event run and it was a multi-day point-to-point race that ran through Germany, Italy, Austria, Switzerland and France. Imagine that scenery, blowing past at high speed! The three-car Alpine team shared overall top honors with the German Adler team. This car went from the tour to Brooklands, where it competed in event after event, first averaging 85 mph over an hour run – later it would average over 107 mph. Subsequent runs would climb even higher – up to about 130 by the time racing at Brooklands ended. This was a serious speed machine in its day. Bonhams has compiled an impressively immense history on this vehicle and you can read more about it here. It’s an incredible car and to the right person it will be worth a lot of money – as in between $1,300,000-$1,900,000. Check out more from Bonhams here. This entry was posted in Uncategorized and tagged 1934, alpine, auctions, av105, Bonhams, cars, classic cars, racer, talbot by classiccarweekly. Bookmark the permalink.